These guidelines are set by the Department of Environment and Heritage and Aboriginal Affairs. Lake Gairdner is dedicated under the South Australian National Parks and Wildlife Act 1972. Lake Gairdner is a public road. All vehicles must adhere to the motor vehicle rules and regulations as they apply in South Australia. Vehicles must be registered or have a permit, motorcyclists must wear helmets, all drivers and riders must be licensed. All vehicles driving on to the lake will be inspected for excessive fluid leaks. Whilst on the salt all vehicles must be parked on a protective tarpaulin. Failure to do so will lead to expulsion from the salt. A specific zoned and cordoned area must be zoned for visitors going to activities on the lake surface. See Track Map. Owners of vehicles parked in the wrong place will be given one opportunity to remove their vehicle, failure to do so will result in the vehicle being moved for them. All access to the salt lake is via the Mt. Ive station road. Outside of Speed Week, all arrangements and payments for access provisions to the lake access ramp must be made with the management of Mt. Ive station. During Speed Week a Lake Entrance access fee must be paid per person at the entrance to the lake. Upon payment you will be issued with an arm band to be worn at all times. No camping or accommodation arrangements are permitted on the lake surface with the exception of the security crew. Periodic inspections of all land speed activities on the lake surface will be made by DEW rangers to ensure all requirements are being met or complied with. A final inspection will be completed after all activities are completed to determine the refund of the environmental impact bond. The use of glass materials on the lake surface is banned as the white surface renders glass objects almost invisible and consequently a serious danger if broken. Spectators are reminded that what ever they bring onto the lake they should take with them when they leave, especially cigarette butts. Dust off procedure All vehicles entering and leaving the Lake must beblown off thoroughly with a supplied leaf blower to remove dust (entering) and with a broom to remove salt (departing) from underneath guards/chassis etc. This procedure is to be carried out at entry/exit point to the lake. Temporary portable hangar accommodation may be erected on the lake surface to provide land speed vehicle cover. However the extent and size of such structures, and how they are anchored and erected must be arranged with DEW. All fuel and lubricants on the lake surface must be stored with a collapsible containment bund made of impervious oil resistant material, with sufficient capacity and strength to contain the volume of fuel stored. All vehicles, equipment, generators, batteries and tools must be located on impervious oil resistant tarpaulins to prevent oil damage to he salt surface. Members staying at the Mt.Ive camp are asked to take extreme care of the sensitive saltbush and bluebush through the western myall woodland. The course will be closed at any time the committee feel it is unsafe to race. The Chief Steward can close the track anytime there are considered to be not enough cars running or likely to run. Please show respect for the land and its people by following the code of conduct. Stay within the Speed Week Area and on the marked DEW authorised tracks and trails to minimises the likelihood of Participants becoming lost or injured or damaging the environment. Avoid taking short cuts and disturbing vegetation. All Participants of any Events are required to implement the “clean footwear policy” by arriving with clean footwear and, where possible, not traversing muddy ground where soil may accumulate on shoes. Be respectful of other users of the trail and exercise care at all times. Ensure that all Participants are aware of the shared use of the Speed Week Area and the required DEW authorised tracks and trails being used for the Event and the public use of the Park. Ensure that all Participants are aware of the public nature of the Park and that they are representing the Event to the greater South Australian public and should be acting accordingly to other park users including possible residents, lesees, and other hirers. Ensure that all Participants are aware of any Exclusion Zones as notified by Monitors or the DEW Ranger in Charge and DEW Regional Representative (including but not limited to unauthorised areas, other hireable facilities, leased area, residential areas etc) that may exist within the Park or be located near the Event course and ensure the Event course will be designed as such to prevent Participants from entering these areas. This is a zero waste Event, participants and the Event Organiser are responsible for the	collection and removal of their own rubbish. Do not litter along the trail or in the Park. Domestic animals and pets are prohibited in Lake Gairdner National Park. The DLRA, DLRA’s Officals and Volunteers and Participants must not remove or permit to be removed, damage or permit to be damaged, any animal, bird, vegetation, plants, fruit or seeds from or on the Park. Ensure Participants are aware of the fragile nature of the Park and that all activities will be conducted to minimise damage to the environment. Creeks and streams along the Event route are in the catchment of key reservoirs or pass through residential areas. Do not go to the toilet within 100m of a watercourse. Participants are advised to use the toilets provided. However in an extreme emergency you are advised to choose a spot off the path and at least 100 metres from watercourses and to bury all faecal waste and paper as deep as possible, preferably at least 15 cm deep. Take all sanitary items out of the park with you and dispose of appropriately. 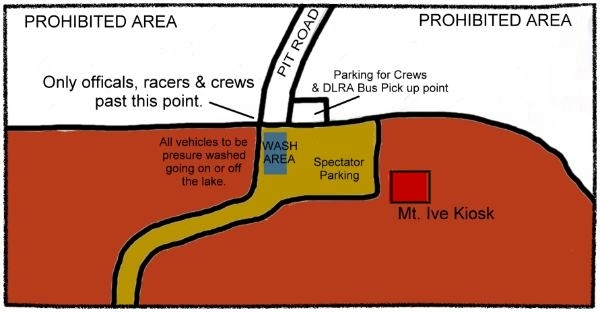 Where applicable, all vehicles entering the Park for the Event must display a valid permit to show that all entry and camping fees have been paid. Failure to display a permit may result in a fine. Animals can be easily panicked or take flight which may lead to injury or distress particularly at night. At the unlikely Event of a fire ban or other fire restrictions, please do not light fires. Restrict smoking to cleared areas at checkpoints (dispose of cigarette butts in bins). Thank you for leaving the bush in its natural state for the enjoyment of others.